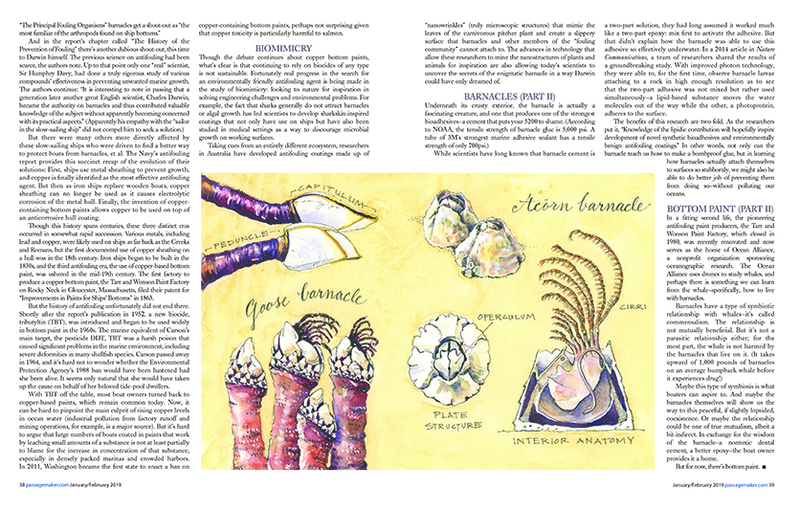 It’s not every day an editor needs illustrations of barnacles. 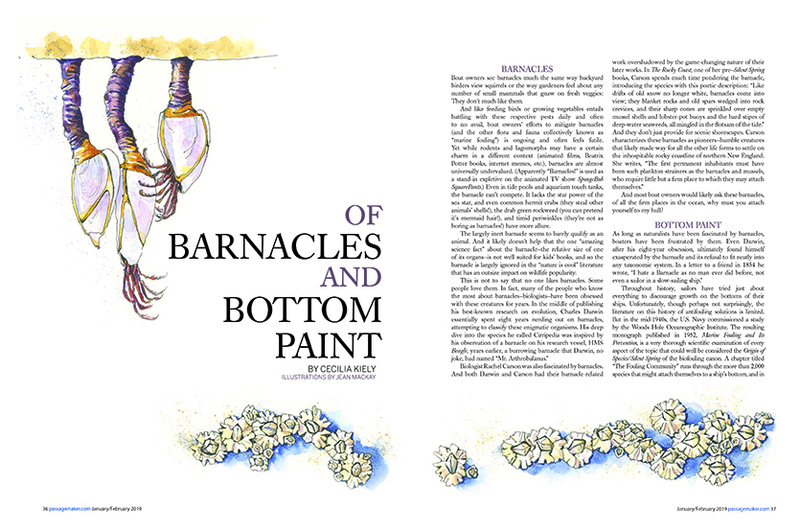 It’s not every artist who could say, “Yes, I’ve drawn lots of barnacles.” So when an editor from PassageMaker Magazine contacted me so see if I might like to illustrate an article on barnacles and boats, how could I refuse? 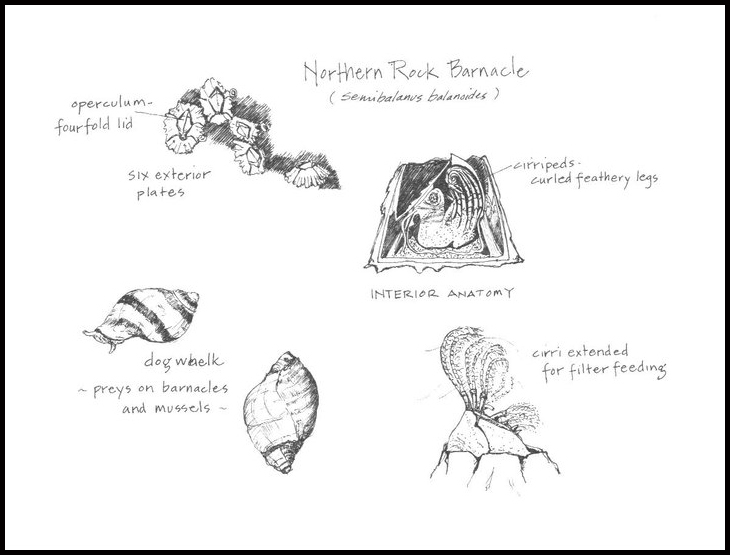 All those days I spent poking in low tide pools at the edge of the sea and sketching its inhabitants prepared me well for just such an assignment. It’s not every day that natural history, art, exploration, and financial reward come together for me in such a satisfying way. I’m really pleased that this turned out so well. Tips and Techniques– “Day after day, never fail to draw something which, however little it may be, will yet in the end be much,” advised Italian painter Cennino Cennini in 1390. Don’t wait for a grand subject for sketching practice. Look at the things around you and jump in. 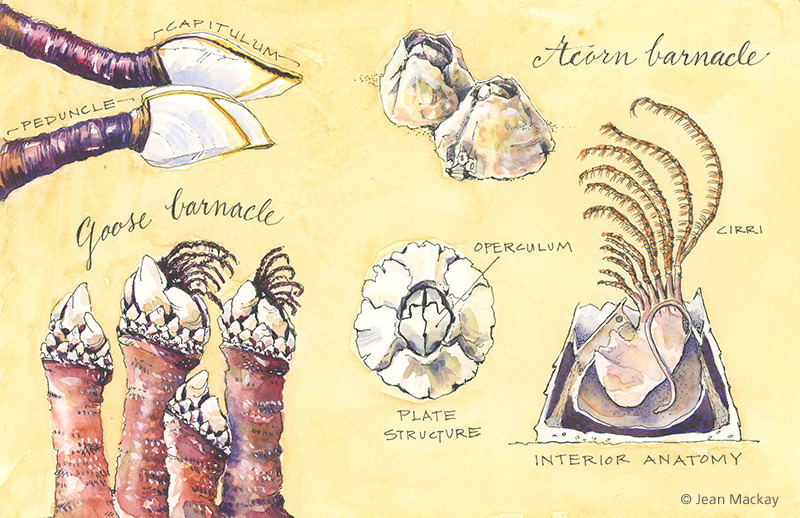 Even a lowly barnacle — small, ordinary, and ubiquitous — may prove more fascinating and beautiful than you realized. The weather in Ireland is notoriously changeable– sunny skies turn overcast and give way to misty rain within an hour’s time, and may just as quickly change back to clear blue, only to fill with rain again by day’s end. Unless, of course, it’s steadily raining, in which case, it will likely rain all day. This makes sketching in Ireland a bit of a challenge, but it also adds drama to already dramatic landscapes. The sketch of Dunmore Head on the Dingle Peninsula is one of my favorites. I had seen this view in travel guides (in sun, of course), and its sheer cliffs, crashing surf, grazing sheep along the trail, and circling gannets made hiking here a grand experience. A break in the soaking fog gave me just enough time to put pen to paper. We also had a stunningly beautiful morning in which to explore tide pools at White Strand beach just west of Cahersiveen Town on the Ring of Kerry. We saw all of these creatures (and more) but I didn’t paint them until later that day, indoors, when it was raining. Tips and Techniques– If you are planning to sketch while traveling, jump in when something strikes you. Don’t wait for a better view or clearer skies. Don’t second guess whether the subject is worth it. Everything you put in your journal, no matter how small or seemingly mundane, adds something to the whole. I had a few moments of hesitation and regret the lost opportunities. Conversely, I’m glad I included small wildflowers and cups of tea and coffee, as these details would soon be lost if not recorded. I love the way small creatures find refuge in and on one another in the sea. Kelp, bryozoans, barnacles, mussels– life upon life, tangled and cemented together. Tossed up from the depths, it’s a pleasure to find these beauties within reach. I will be giving a presentation of my artwork as part of the library’s Arts & Literature lecture series. 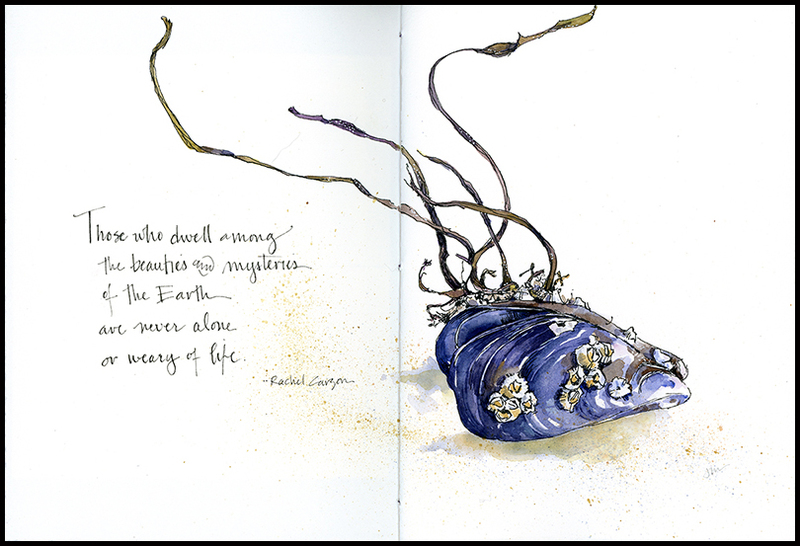 Take a look inside my sketchbooks and at my natural history illustrations and discover a world of color, inspiration, and a few surprises. I’ve just returned from a week in the Pacific Northwest—land of big trees, mountains, skies, water, and wilderness. 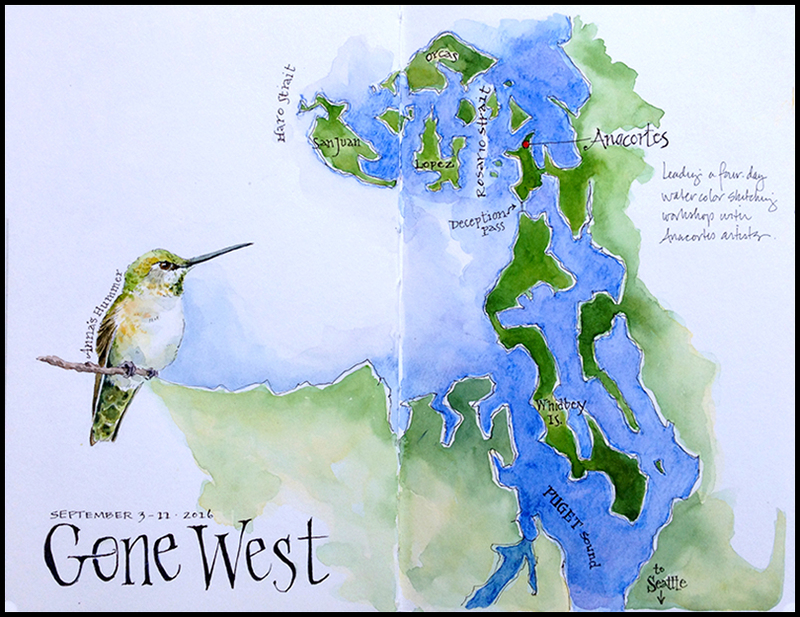 I had the privilege of teaching a four day watercolor sketching workshop with an enthusiastic and talented group of artists from Anacortes, Washington. I’ll share a few lessons from the workshop here soon…but first, let’s start where so many of my travels begin: with a map. It has been 30 years since my last trip to the Northwest, so this painting helped me to get a good sense of the lay of the land. I had hoped to see some western bird species and was delighted that Anna’s hummingbirds were near daily visitors to the backyard where I stayed. I mainly saw the female, which is less colorful than the male, but no less interesting. Before the workshop began, I took two days to explore and hike. 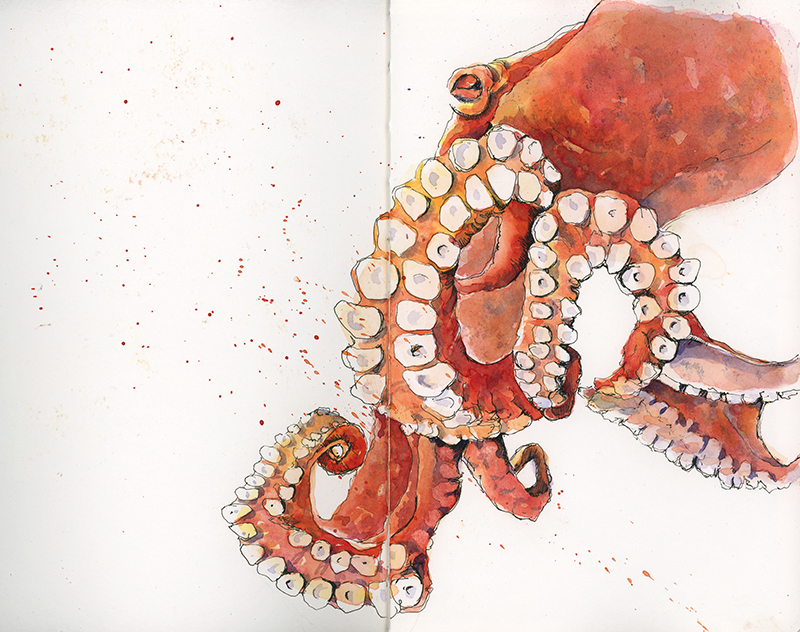 I painted this octopus from a video in anticipation (i.e. wishful thinking) of seeing one in a west coast tide pool. 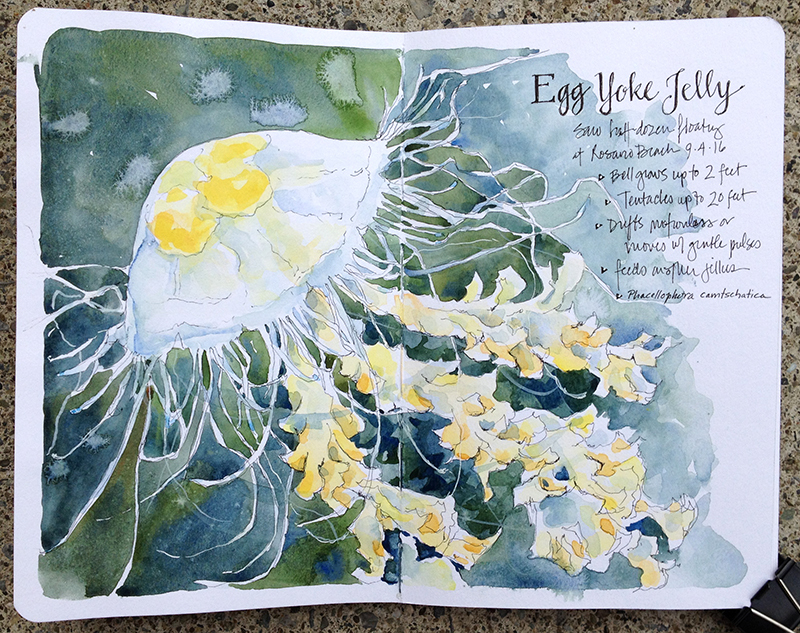 No luck; but I did see nearly a dozen egg yolk jellyfish, a fairly common west coast species, as well as other fascinating denizens of rocky tide pools in the Puget Sound. 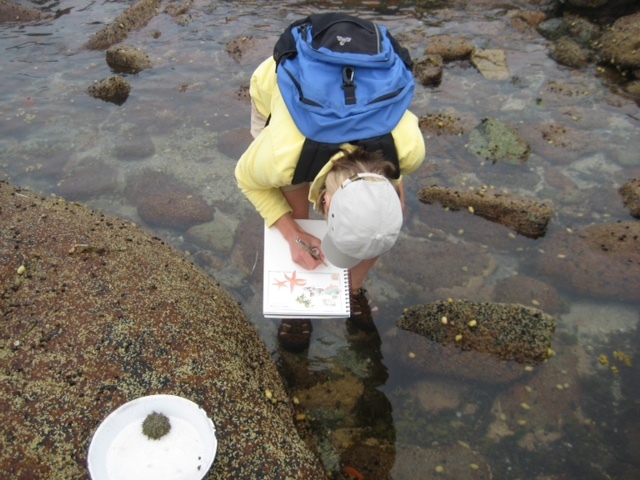 For many years now, I’ve clamored over granite ledges, slippery seaweeds, and sharp barnacle-laden rocks to explore the watery realm of Maine’s tide pools. When the sea retreats at low tide, a world of strange and tenacious creatures is revealed. I go in search of spiny urchins, orange and green sea stars, feathery anemone, scampering hermit crabs and slow moving snails, tunicates, blue muscles, dog whelks, sponges, lurking crabs and, always, the unexpected. I bring my sketchbook and a pen and draw until the tide turns. After this year’s adventure, I went back through my sketchbooks over the last 10 years to compare the drawings and the treasures found. Enjoy! Though I work outdoors using a portable set of watercolors all the time, I realize that many people work almost exclusively indoors from photographs and a much larger set up. People often ask me how to get started working outside. Figuring out how to lighten the load is key; and once done, it opens all sorts of great possibilities for painting. 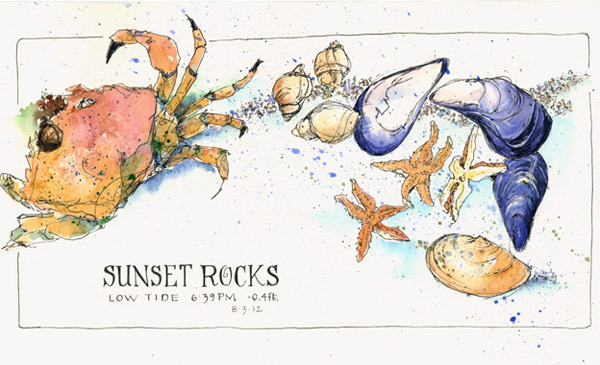 Immersed in drawing the tide pools of Maine’s rocky coast. 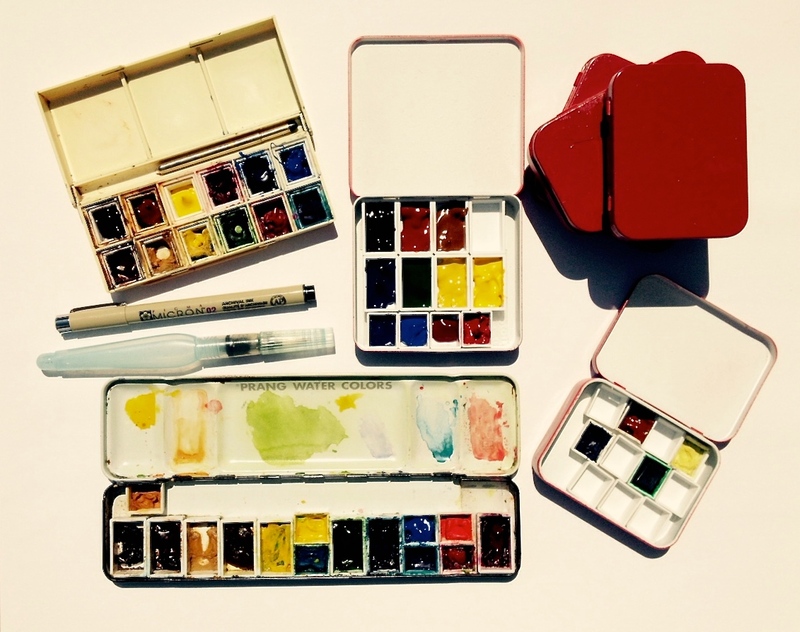 Windsor and Newton Cotman box, small mint tins in various stages of transformation (inside spray painted white and outside spray painted red), Prang watercolor tin revamped with full and half pans (this is my current box). I ordered the plastic pans online for about .69 cents.They’re held in place with Scotch restickable strips for mounting. Figure about $10 to configure a box of 12, plus paint. I use Windsor and Newton and Daniel Smith tube paints to fill them. To really travel light, I bring just a waterproof pen, a waterbrush, and a couple of paper towels or a bandana to clean the tray and wipe the brush between colors.